NASA's InSight Mars lander launch may be visible to millions of spectators across Southern California during its predawn launch in May 2018. 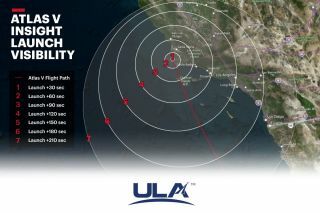 This United Launch Alliance map shows the range of visibility for the launch. Residents across Southern California can witness the launch of new lander bound for Mars before dawn on Saturday. NASA is hoping for good weather to launch the mission, called InSight, on its nearly seven-month journey to the Red Planet. Even if you don't live in Southern California, you can still watch InSight's launch live; just tune in on Space.com here, beginning at 6:30 a.m. EDT (1030 GMT), courtesy of NASA TV. But if you will be in the visibility area, read on to see what to expect early Saturday. A United Launch Alliance Atlas V rocket will loft InSight toward Mars. Because the Atlas V will launch on a southward path after liftoff, spectators in Southern California, from Santa Barbara through Los Angeles and San Diego, should get a good view of the rocket rising into space. Early risers should concentrate their view toward the north-northwest as the rocket traces a bright arc across the western sky. The weather forecast is currently favorable for the launch, indicating generally clear skies, a light north-northwest wind and air temperatures hovering within a few degrees of 50 Fahrenheit (10 degrees Celsius). NASA officials have warned thatearly morning fog could obscure visibility for spectators close to the launch site. The fog should top out at 600 feet (180 meters), so if you plan to watch InSight's launch in person, a viewing spot above that 600-foot mark, like a hill or ridge, may be a good bet. Mars is looking good, too! This NASA map shows the location of Mars at 6 a.m. your local time on May 5, 2018, the same day NASA will launch the InSight Mars lander to the Red Planet. Mars will be near the moon, with Saturn also visible. Currently, the Red Planet rises around 1:30 a.m. local time. A few hours later, before the break of dawn, it can be readily found in the south-southeast sky, glowing with a brilliant and steady orange-yellow light. Mars is currently shining at a magnitude -0.5 on the brightness scale used by astronomers (negative numbers indicate brighter objects). Among the stars, only Sirius and Canopus are brighter. But as Mars continues toward opposition — its closest point to Earth this year — it will only get more dazzling. Currently, Mars is 76 million miles (123 million km) from Earth. But on July 30, the Red Planet will be the closest it has come to Earth — 35.8 million miles (57.6 million km) — since 2003. By July 30, Mars will visible from dusk to dawn and shine nine times brighter than it does now! Finally, if you're up before sunrise on Sunday morning, the moon will make for a striking sight, with Mars around 2 degrees to the lower right of Earth's satellite. The 1,380-lb. (625 kilograms) InSight Mars lander is, in essence, a laboratory focused on investigating the interior and subsurface of Mars. The name "InSight" is not quite an acronym, but more of a compression of the mission's full title: Interior Exploration Using Seismic Investigations, Geodesy and Heat Transport. InSight mission scientists hope to answer several questions, such as just how thick the Martian crust is and how much heat is released from just beneath the surface. Scientists also hope to get a good idea as to just how large Mars's core might be and check on any seismic activity, or "marsquakes," that might periodically occur. InSight is the first Mars mission built to study the Red Planet's structure. In addition, two smaller cubesat satellites, each about the size of an attaché case, will travel on the same mission and will relay transmissions from the Martian surface back to Earth. If other issues postpone the launch, NASA has additional opportunities over the next five weeks to get InSight off the ground before the end of the current orbital alignment between Mars and Earth, which is favorable for such missions. Even with delays, however, InSight's arrival date at Mars will remain the same: the Monday after Thanksgiving, Nov. 26. Built by United Launch Alliance, InSight's Atlas V rocket has an excellent record over these past 16 years, having launched a number of commercial, scientific and military payloads. Versions of an Atlas V launched the Mars Reconnaissance Orbiter in August 2005 and the New Horizons probe to Pluto and the Kuiper Belt in January 2006. Visit Space.com Saturday for complete coverage of the InSight Mars lander launch.